The owners had specific requirements for the redesign of their 16 year old builder- grade kitchen. First, the new kitchen design could not add any square footage but needed to eliminate existing bottlenecks without sacrificing the island. 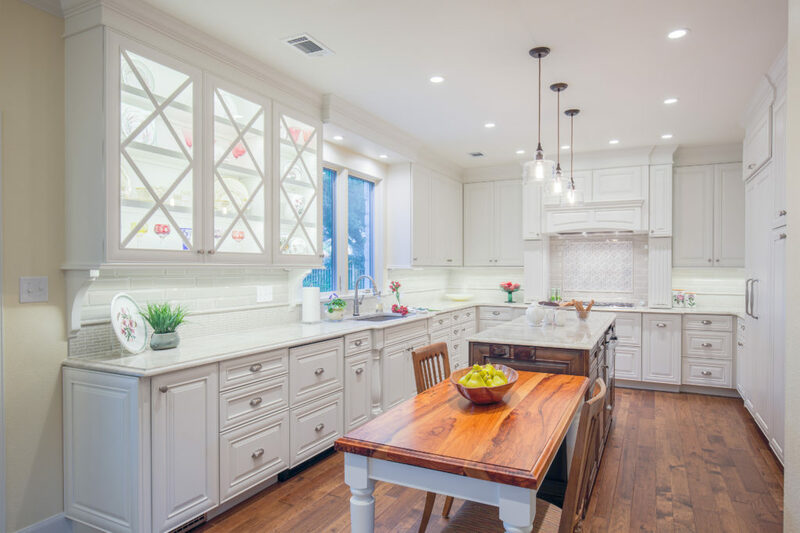 Second, the owners desired a design that: utilized the space more efficiently, possessed distinct focal points and upgraded appliances, and embraced the elegance and charm that reflected their style. Third, the new layout would need to relate to the breakfast nook and the newly completed outdoor living space. Fourth, the new design would need to incorporate a layered lighting plan that not only illuminated the space for general and specific tasks but that would showcase their collections of crystal and china. 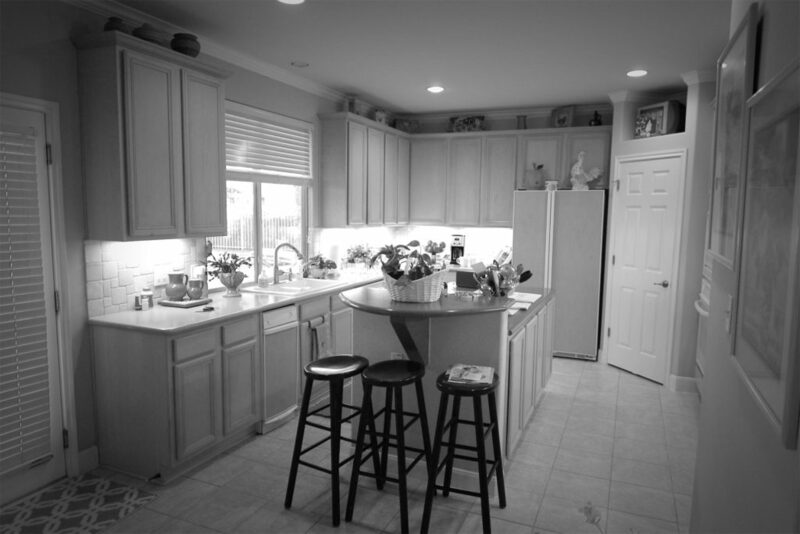 To address these items we redesigned the kitchen to function in zones. The kitchen now has multiple work stations which allows more than one cook to perform various duties without being in each others way. “Zoning” the kitchen also granted us the ability to create an entertaining area that related to the outdoor living space without increasing the footprint. We began by squaring up the space. First, we removed an angled walk-in pantry which took up a lot of real estate. This gained space for the new appliance garages, cabinet style pantry, and new fully integrated Thermador freezer and refrigerator columns; thus establishing a breakfast/coffee zone. Next, we eliminated an under- utilized built-in desk in order to create a bake center with new Thermador steam and convection ovens. 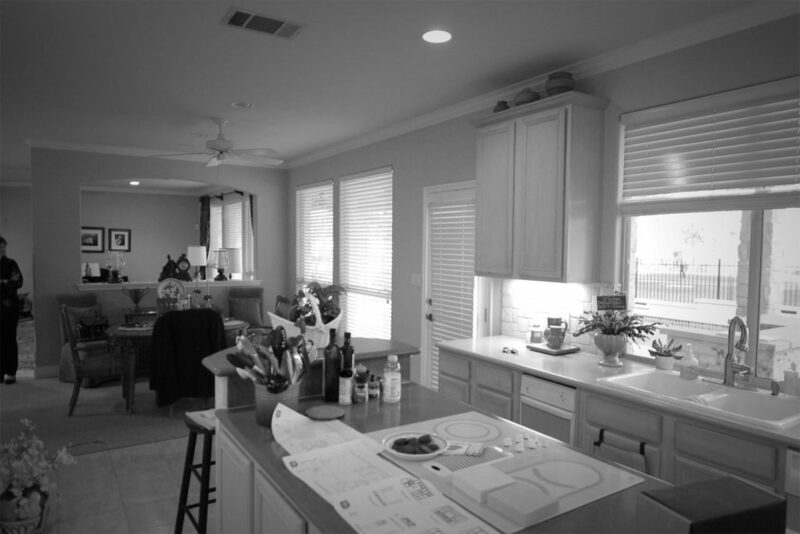 The existing cooktop was formerly in the island directly across from the sink; separated by a cramped 36″ wide aisle. We replaced the electric cooktop with a Thermador gas unit and moved it to a more prominent position in the new design, surrounding it with a distinctive mantle hood. This not only eliminated the bottleneck between 2 of the main components of the work triangle, but also created a focal point. The existing down-draft vent was also removed from the island and replaced with an adequately paired overhead vent liner. By doing this we were able to obtain much needed cabinet storage in accessible locations. However, in relocating the vent we encountered our first obstacle; which was having to modify the hood duct to prevent compromising the existing roof trusses. The new island is now centered in the space and is an appropriate size to accommodate NKBA recommended work aisles. The island functions as additional prep space shared between the cooktop, refrigerator and ovens. It houses the new microwave drawer, a secondary trash/recycling unit, and roll-out drawers for universal access. All of these items are strategically placed to be shared by multiple zones without overlapping the users. On the perimeter wall we replaced a swinging door and windows with an 8′ wide full glass sliding unit. This created a direct traffic pattern between the new pool and powder bath without disrupting the dining or kitchen areas. 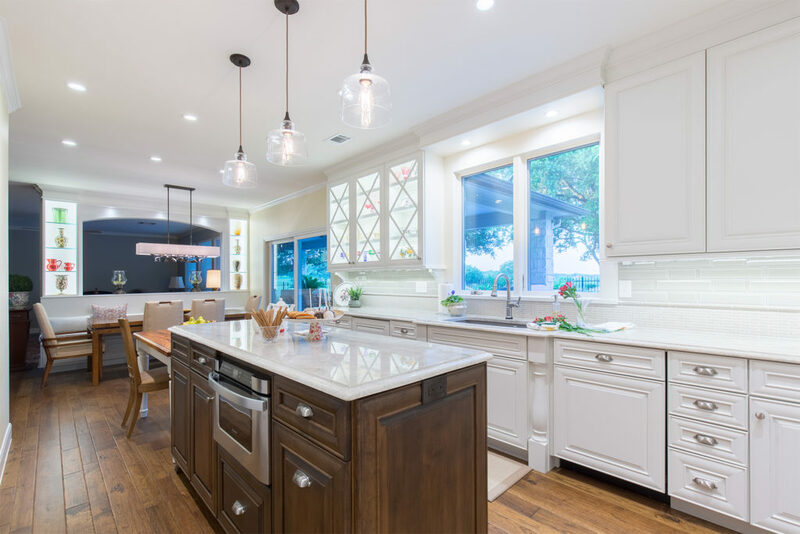 Additionally, this leveraged more linear space to incorporate a new ice maker, custom liquor drawers, trash unit and refrigerator drawers which service both the sink and the outdoor entertaining areas. Finally, the use of the full glass sliding doors added a visual connection to the pool and golf course views while increasing the natural lighting quotient into the kitchen and breakfast area. One of the largest hurdles we faced was in the installation of the sliding door unit. The existing slab was out of level by by 1-1/4″ over the span of 24 feet. Due to the patio work already being underway by a different company we could not level the slab. Therefore, we worked with the stone masons to cut the new patio stones to match the the elevation of the slab and shimmed the new door unit to make it level. On the inside of the kitchen we reduced the height of the toekicks and increased the height of the 2 step crown moulding in order to mask the slope of the slab. The final result is a flawless finish out and the issue is undetectable; testament to impeccable craftsmanship. The new lighting plan incorporates layers of dimmable light sources in precise locations to create a multi-layered effect. Task, decorative, accent, and ambient light sources are all meticulously coordinated for color temperature and correctness to enhance the design. The owners’ collections of vases and dinnerware are now brilliantly displayed while the overall illumination is greatly enhanced to suit the new spaces. Innovative uses of materials and construction methods can be observed in the use of superior LED lighting technology and the knowledge of our master electrician. Through creative thinking we devised a strategy to conceal the LED strips to provide an even illumination and prevent shadows, thus producing the “glowing” effect seen in the glass door cabinets and the new banquette display shelves. Our clients were granted everything on their wish list and more. The new layout works exactly as they requested and they were ecstatic about the addition of the new banquette seating.